Central Mountain Air Ltd. is a Canadian regional airline based in Smithers, British Columbia. It operates scheduled and charter services and transborder services. 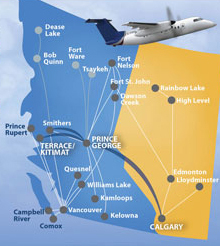 Its main base is Smithers Airport, with other bases at Calgary International Airport, Vancouver International Airport and Prince George Airport.